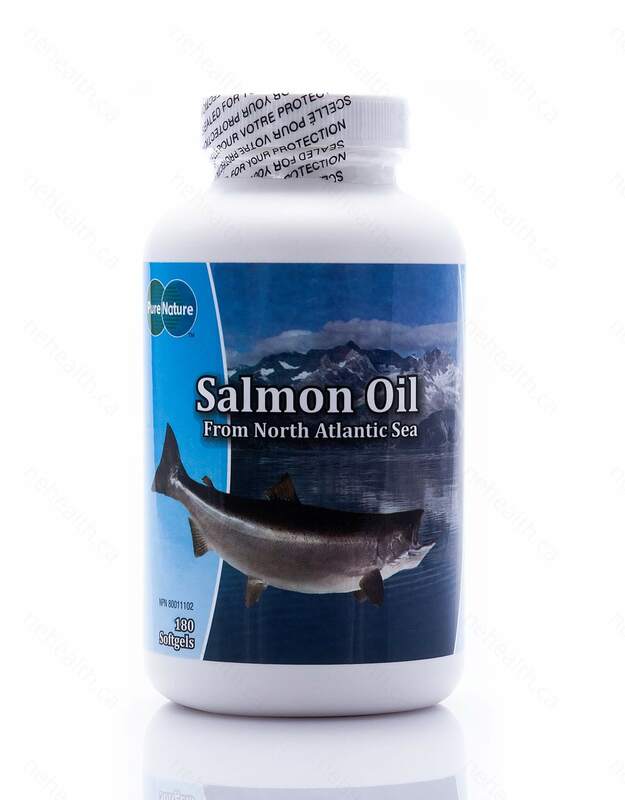 Pure Nature Salmon Oil provides a good source of EPA and DHA sourced from the North Atlantic ocean. 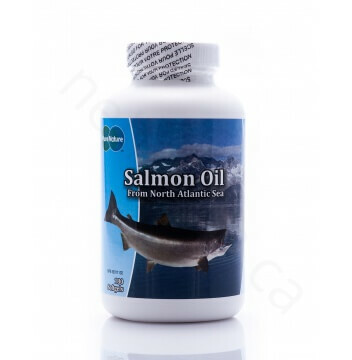 With each capsule containing 1000mg of salmon oil, this product provides additional Omega 3s to a healthy diet. Omega 3s have been shown in thousands of studies to benefit health most notably as an anti-inflammatory throughout the body. A lack of Omega 3s have been implicated in sore joints, dry skin and eyes, pain, impaired memory and concentration and slower wound healing among many other issues. Omega 3s are vital for good health and Pure Nature Salmon Oil gives you and your family a convenient way to receive these benefits each day in an easy-to-take capsule form. Made in Canada. Omega 3s are a group of fats (fatty acids) that belong to a bigger group called polyunsaturated fatty acids (PUFAs). This group also includes the other well known fatty acid groups, the Omega 6s and Omega 9s among several other groups, although all these groups have different functions in the body. Omega 3s are primarily found in marine mammals but can also be found in plants, nuts and seeds and are essential for the human body to function and are well known for the benefits listed above and many others. What if I get repeat of the fish oil? 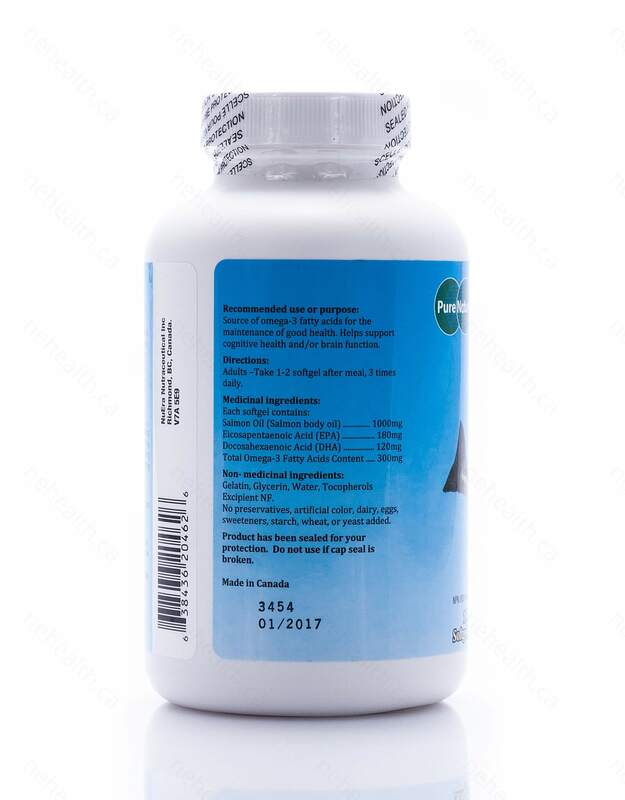 If, when taking fish oil capsules, there is repeat (burping or fishy taste) after consuming, take the fish oil capsules first thing before eating a meal instead of after. What about contamination of heavy metals? 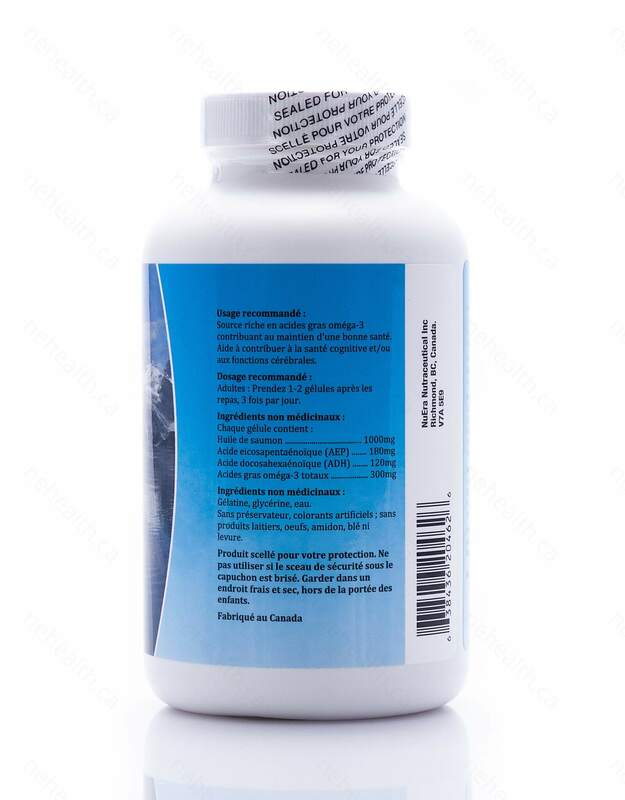 Health Canada has mandated that all fish oil sold in Canada must be tested for heavy metals. Other values must also be tested before sale to consumers that includes peroxide, anisidine, totox, dioxins, PCBs among several other compounds. Gelatin, Glycerin, Water, Tocopherols, Excipient NF. Product has been sealed for your protection. Do not use if the cap seal is broken. Goodnight, SH Jr, William S Harris, and William E Connor. "The effects of dietary omega 3 fatty acids on platelet composition and function in man: a prospective, controlled study." Blood 58.5 (1981): 880-885.